[H,tau] = getDelayModel(sys) decomposes a state-space model sys with internal delays into a delay-free state-space model, H, and a vector of internal delays, tau. 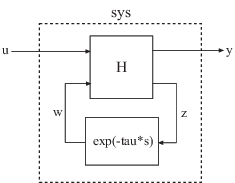 The relationship among sys, H, and tau is shown in the following diagram. Delay-free state-space model (ss). H results from decomposing sys into a delay-free component and a component exp(-tau*s) that represents all internal delays. If sys has no internal delays, H is equal to sys. Vector of internal delays of sys, expressed in the time units of sys. The vector tau results from decomposing sys into a delay-free state-space model H and a component exp(-tau*s) that represents all internal delays. If sys has no internal delays, tau is empty. For explicit state-space models (E = I, or sys.e = ), the output E = . If sys has no internal delays, the outputs B2, C2, D12, D21, and D22 are all empty (). Decompose the following closed-loop system with internal delay into a delay-free component and a component representing the internal delay. 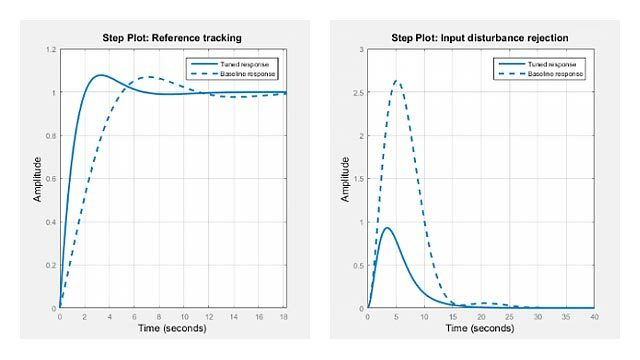 Create the closed-loop model sys from r to y.
sys is a state-space (ss) model with an internal delay that arises from closing the feedback loop on a plant with an input delay. Decompose sys into a delay-free state-space model and the value of the internal delay. Confirm that the internal delay matches the original input delay on the plant.